Once again, it is time for our weekly news round-up, where we put the most interesting stories from the past seven days for anyone who needs to catch up. We feel obliged to start with the iPhone 6s announcement as it was the event that drew the most attention last week. Apple's latest smartphone adds an upgraded camera, a faster processor, and an innovative display technology called 3D touch, among other perks. 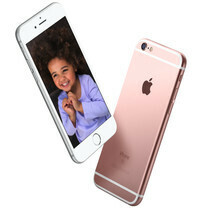 And it comes in two sizes – a 4.7-inch model and a 5.5-inch variant called the iPhone 6s Plus. In other news, last week brought us a handful of Nexus leaks. The upcoming smartphone was exposed once again in a couple of images, along with a list of hardware specifications. And speaking of leaks, an alleged Nokia smartphone surfaced on the web. It is referred to as the Nokia C1 and it is said to be a 5-inch smartphone powered by an Intel Atom SoC. Oh, and it is an Android smartphone. For more of last week's read-worthy news, flip through the slideshow below. The iPhone 6s and iPhone 6s Plus may look identical to their predecessors on the outside, but they've been vastly improved on the inside. Their displays feature an innovative 3D touch technology, which allows them to register pressure strength. Inside them runs a new A9 SoC that is 70% faster than the A8 in CPU tasks. The camera is now a 12MP one with improved auto-focus, while the front-facing one has a resolution of 5MP. And there's a new color option called rose gold. Pre-orders are now live for anyone eager to get an iPhone 6s or iPhone 6s Plus. The iPad Pro was announced at last week's Apple event, alongside the latest iPhones. It is a gigantic tablet with a 12.9-inch display and full support for the multi-tasking split-screen functionality that come with iOS 9. Built with productivity in mind, there's a detachable keyboard and an advanced digital stylus made especially for it (sold separately). Prices for the tablet start at $799. This is believed to be the 2015-edition Nexus 5 smartphone. Rumor has it that the phone has a 5.2-inch LCD display and is 9.8-millimeters thick, including the camera hump. Inside it is expected to beat a six-core Snapdragon 808 processor, alongside 3 GB of RAM. The smartphone is expected to be announced later in September. Mobile payment service Android Pay is now rolling out. Android handsets that come with an NFC chip will be able to use the feature when checking out at retail stores and restaurants that have an NFC-based POS system. Those who had downloaded the Google Wallet app can update it to Android Pay. New users can download and install Android Pay directly from the Google Play Store. New Android handsets from Verizon, AT&T and T-Mobile running Android 4.4 or higher will have Android Pay pre-installed. The Motorola Moto X Force is the unannounced Moto X model that is reportedly sporting a shatterproof display. We expect this device to feature a 5.4-inch display with a 1440 x 2560 QHD resolution. Powered by the Snapdragon 810 chipset, the phone will come with 3GB of LPDDR4 RAM and 32GB/64GB of internal storage. It is rumored that the phone could launch on Verizon as the Motorola Droid Turbo 2, followed by a broader release in December. Motorola Moto X Force coming soon? Yes, that's the date when we hope to see the rumored Lumia 950 and Lumia XL launch, although that could also be the day on which Microsoft plans to announce the two phones, not release them on the market. The Lumia 950 XL is expected to be larger than the Lumia 950. Reportedly, its features should include a 5.7-inch Quad HD display, iris scanner, an octa-core Snapdragon 810 processor, and a 3300 mAh battery. The smaller Lumia 950 should come with a 5.2-inch Quad HD screen, a six-core Snapdragon 808 processor, and a 3000 mAh battery. It's said that both upcoming Microsoft smartphones will have 20 MP PureView rear cameras, and 5 MP front-facing cameras. The Lenovo Vibe X3 is an unannounced smartphone that first showed up way back in February. It appears that the device will soon be available to buy (at least in some regions), as it's just been approved by China's Telecommunications Certification Center. The new Lenovo smartphone runs Android 5.1.1 Lollipop, and sports a 5.5-inch 1080p display. The handset is powered by a six-core Qualcomm Snapdragon 808 processor, measures 154 x 76.4 x 9.4 mm, and weighs 175 grams. Hi PA, There are too many ads in your site now. It is good for your business but the loading time is also getting increased. Please optimise, this will be nice for the visitors. Are you not using 4G. I have no problem loading like yours. Looks like you are on Hspa+? I am using a good LAN wire connection. You sound extactly like those market people trying to sell the 4G sim card.